We're Excited ~ Sew Steady is Here! We are excited to announce that we are a new Sew Steady dealer. Why do we like the Sew Steady tables, well for one they are Made in the USA!! Yeah! 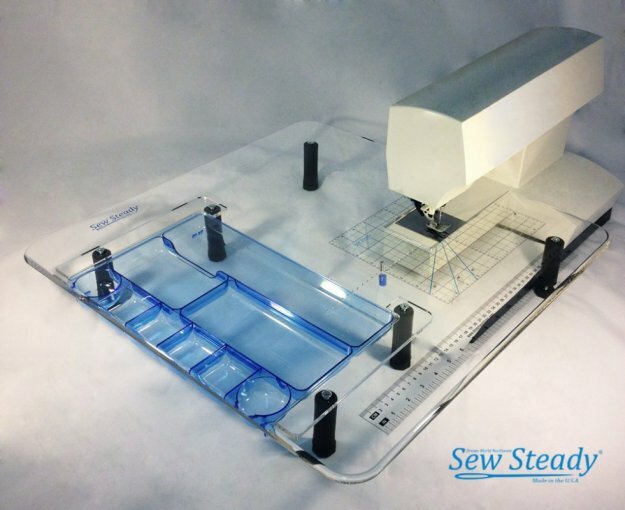 But most of all they are custom made to any sewing machine, so no matter how old or new your sewing machine is you can have a nice acrylic extended work surface which is great for quilting and sewing. Stop by the shop today to check it out, Mabel loves showing hers off. She has everything for her machine organized in the notions drawer. If you don't live close to the shop and would like one, you can order by phone. 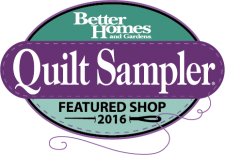 We just need the make and model number of your machine and in 3 weeks time you can be sewing with your new Sew Steady Quilter's Wish Table. Another Great Made in the USA Product! 100% Pure Cotton Batting. They start with the finest USA natural and environmentally friendly cotton and specially processed Dream Cotton so that you can quilt up to 8" apart. No pre-washing necessary! Available in Natural and White in four lofts: request, select, deluxe and supreme. We love the select! Made with a blend of fine Domestic and Merino wool, this wool is scoured and super-washed for superior cleanliness and to eliminate shrinkage. Quilters Dream's unique processing creates wool batting with exceptionally soft drape, uniformity and strength. 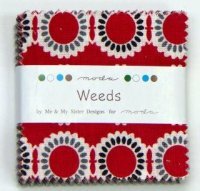 Attention English Paper Piecing Fans - We just received in the mini charms for the cute new line "Weeds" by Me & My Sister Designs for Moda. It would be adorable made into your hexagon shapes. New Books Have Been Arriving as Well! More beautiful toweling is in stock. 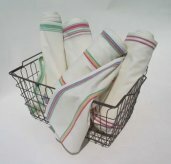 If you haven't made anything yet with the toweling check them out, it's an easy quick item you can make runners, aprons and more with. Classes - We are working on getting everything scheduled, so we will let you know next time the exciting classes that are coming up at M&E.